Here’s a fall to do list of things you should tackle long before the first snow falls. Clean out Your Gutters: Clogged Gutters = Ice dams = Expensive home repairs for you. Get out the ladder and dig out the leaves from your gutters before anything bad can happen to your home. Weather-stripping: When the temps drop, you’ll want to keep your home cozy and warm. That means you need to focus on keeping the cold air out. Seal any window or door frames that have cracks, and you’ll end up saving loads on your heating bill this winter. Get your Furnace Checked by a Pro: Make sure it’s in tip-top shape, and you’ll avoid problems during the winter season. Change Batteries in CO & Smoke Detectors: Keep your family safe and remember to do this simple task. Prep your Chimney: Make sure your chimney is clean and in working order. Also, now is a good time to stock up on firewood! Bring Garden Hoses Indoors: Drain your hoses and bring them inside to prevent freezing. Turn off your water supply lines to exterior faucets while you’re at it. Check your Roof: Cold, wet weather can cause major damage to your home’s roof. To be safe, have a licensed professional come check it out for you. Keep Pests Out: When the temps drop, critters are going to want to find shelter in warm cozy spots. Don’t let that be your home! Stock up on the necessary supplies to keep pests and critters away. Prep your Snowblower: We don’t even want to say the “S” word…but the fluffy white stuff just may decide to fall this winter. Test your snowblower now, so you’re not stuck during that first snowstorm. Being a homeowner comes with lots of responsibility and time spent maintaining your home. 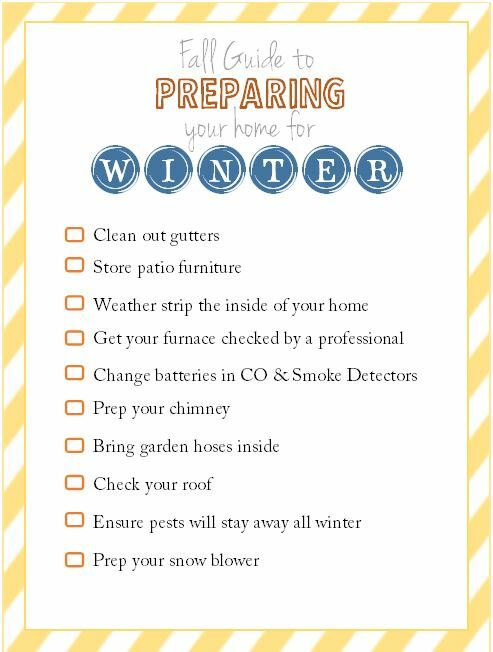 But if you tackle a few of the items on this fall to do list each weekend, you’ll be ready for the winter season. To make sure you don’t miss any of these prepping steps, download and print the FREE checklist here. We want you to keep your “Home Sweet Home” lookin’ good and working well all year-long!